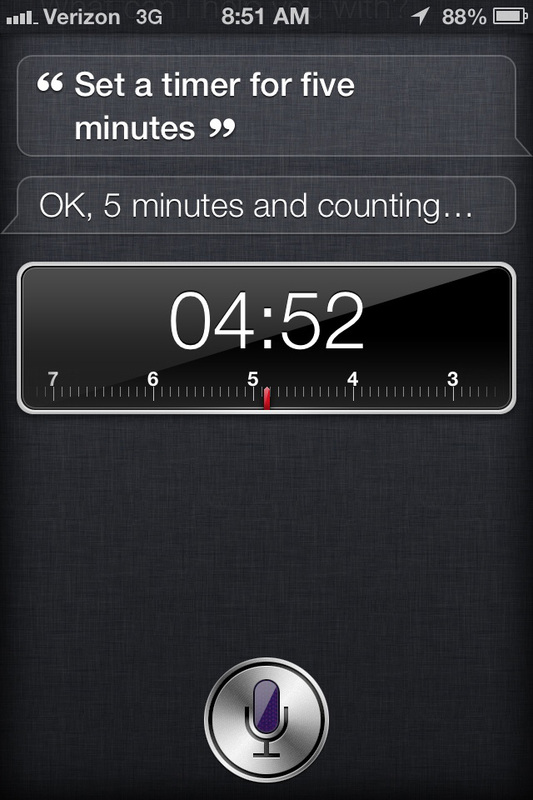 Siri can set a timer. 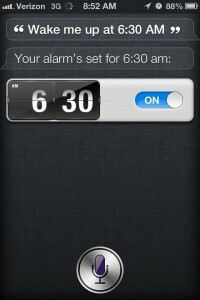 Siri can set an alarm. 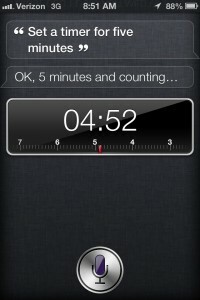 Who needs a boring old alarm clock when Siri can do the same thing and more using nothing but your voice? 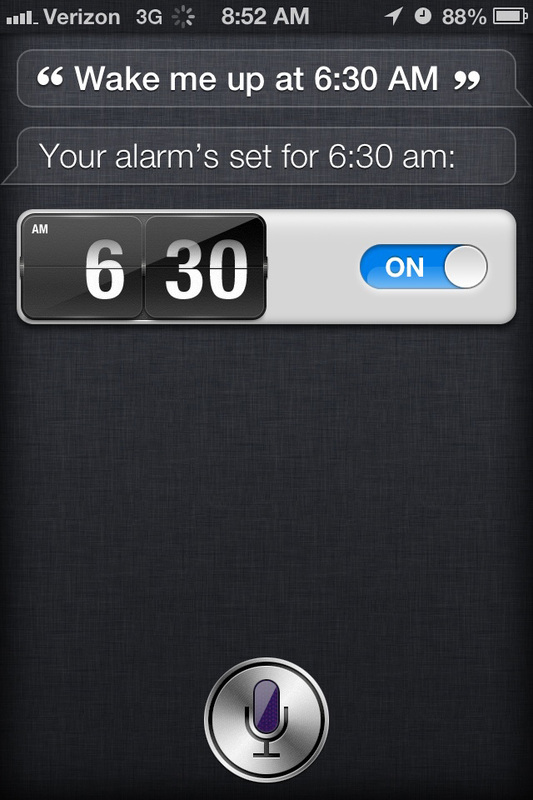 Tell Siri what time you want to wake up in the morning, and she’ll take care of the rest. She can also change settings or cancel an alarm. 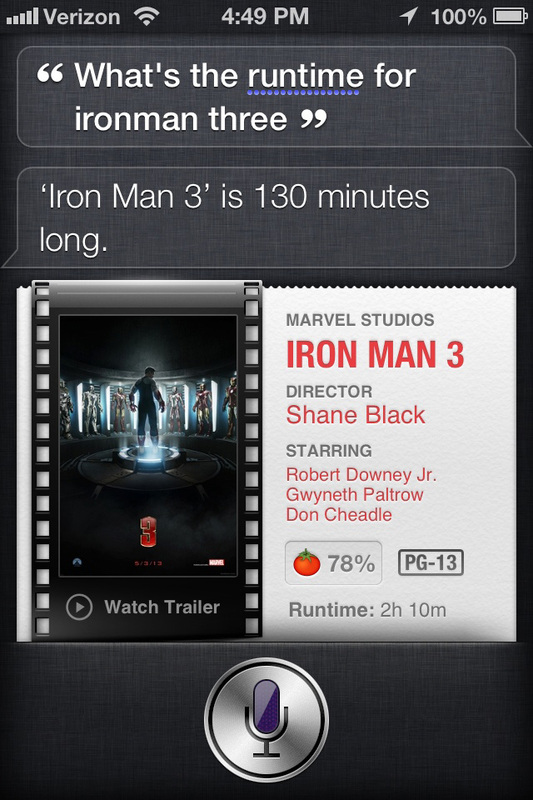 Siri can tell you what time it is (anywhere in the world). Yeah, so it’s not that big a deal that Siri can tell you what time it is, when you can just look at your lock screen and see for yourself. 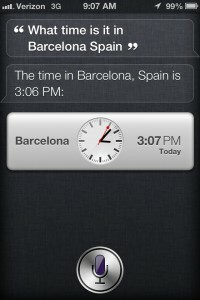 What is more useful is that you can ask Siri what time it is anywhere in the world. You can also ask about sunrise and sunset times around the world. 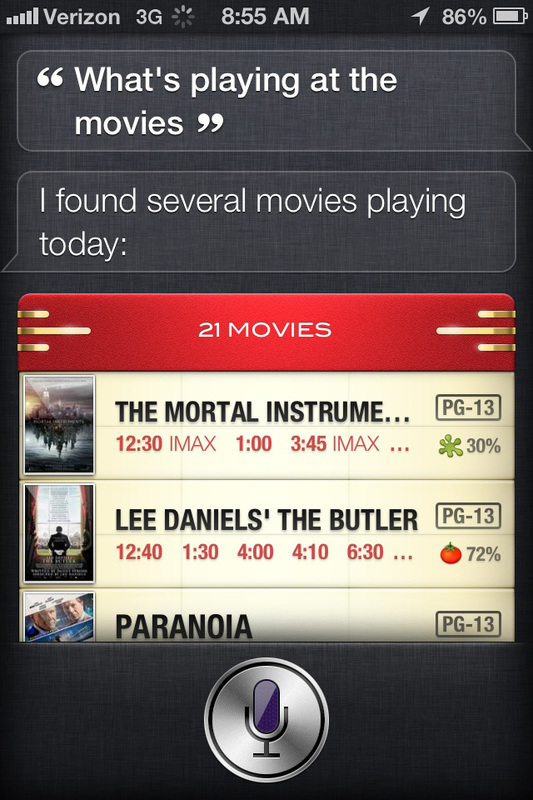 Siri can help you plan your day. If you keep a very thorough and detailed iOS Calendar, Siri can alert you to meetings, classes, or other appointments you have scheduled. 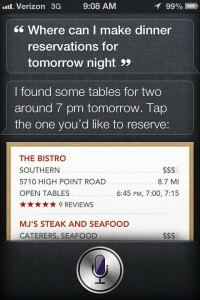 Siri will also help you set up your Calendar and schedule things, so you don’t have to type them in by hand. 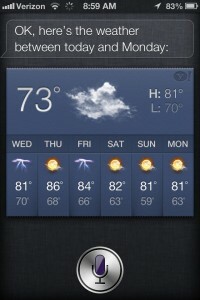 Siri can tell you the weather conditions and forecast. 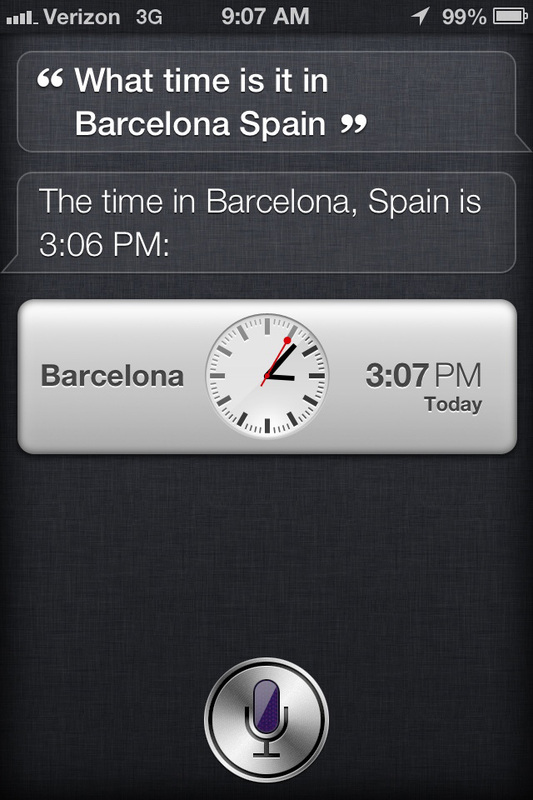 With all due respect to Al Roker, Siri is one great meteorologist. 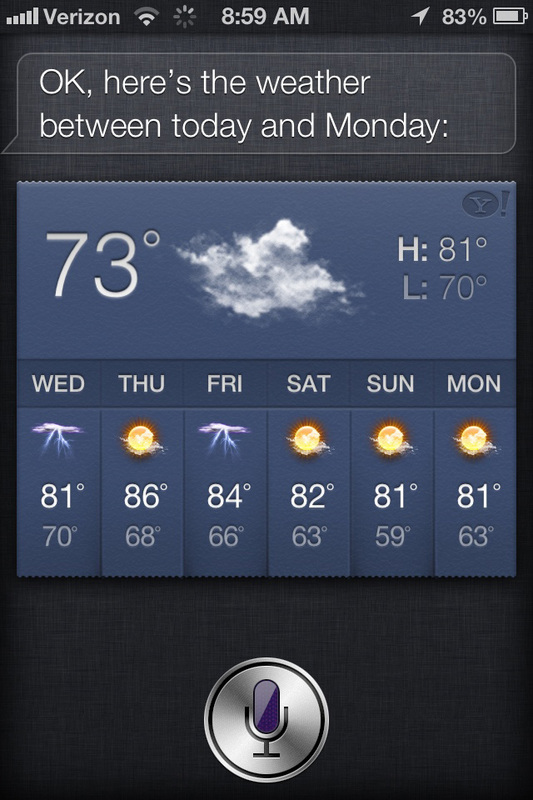 Ask Siri pretty much anything you want to know about the weather forecast (today, tomorrow, this week, etc.) or the current conditions, and she’ll have the answer. And just like the time, you can also ask about the weather for anywhere in the world. 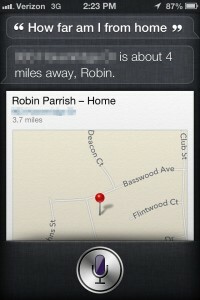 Siri can use Maps and GPS. Siri can show you your current location on the map, your destination, and any address or physical location (like the Statue of Liberty) in the world. Want to know how far away you are from someplace, or how long it would take to get there? Just ask. 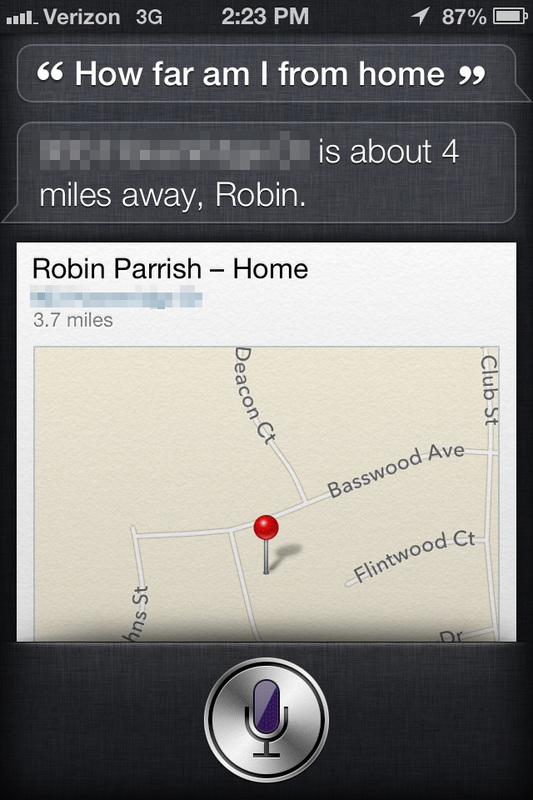 If you use Find My Friends, Siri can tell you where your friends and loved ones are, too. 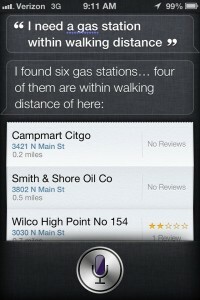 Siri can find nearby places you need, like gas stations, restaurants, movie theaters, and more. Sure, you can ask for the nearest McDonald’s. 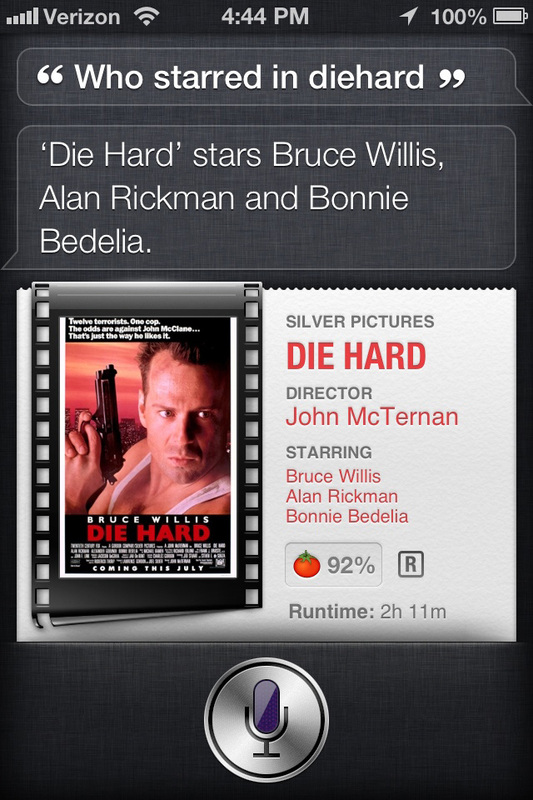 But Siri can get a lot more specific than that. 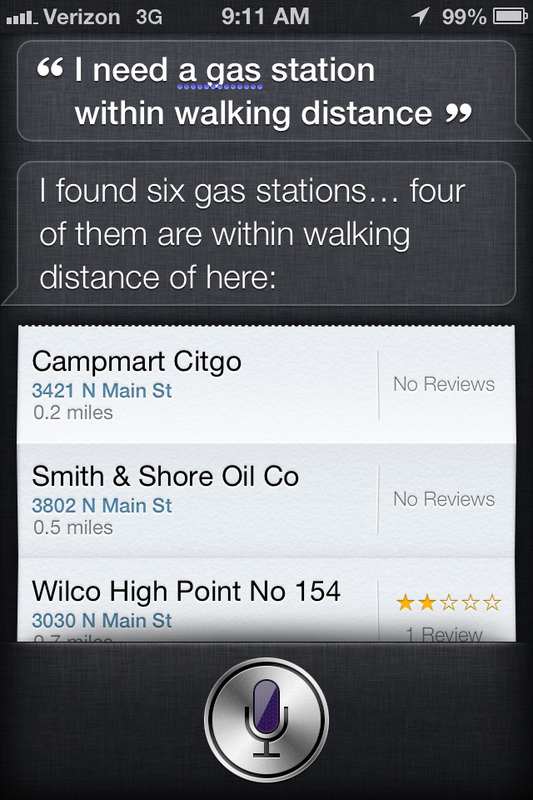 If your car breaks down, Siri can find you a gas station within walking distance. Or say you need reservations for this week for a party of two. 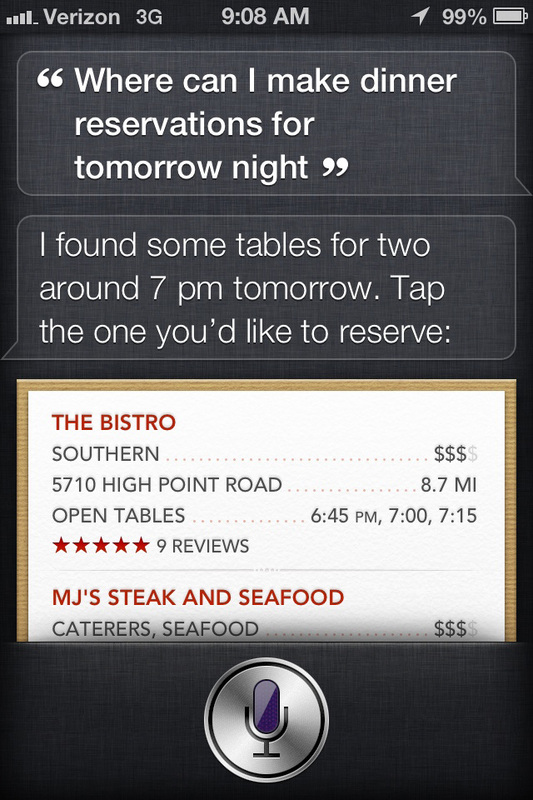 Siri will find a restaurant at which you can make those exact reservations — and even make them for you. Siri can tell you just about anything you want to know about film. 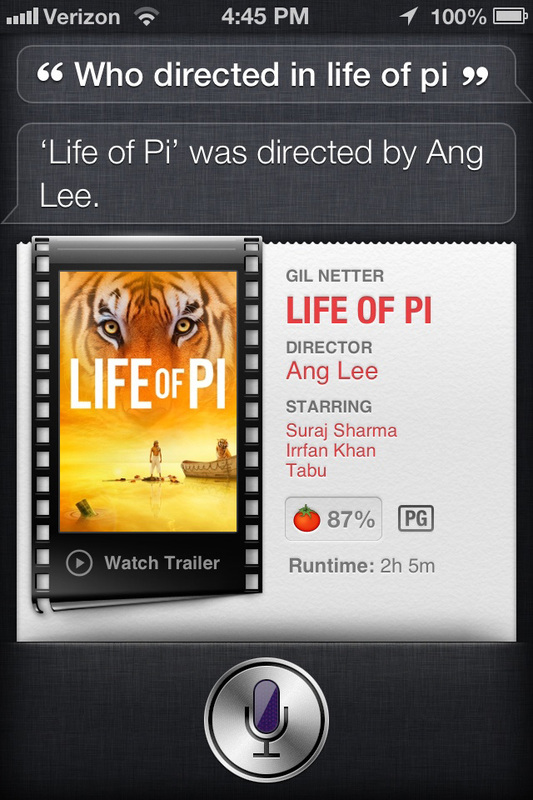 Ask, and Siri will search film history — drawing largely from Rotten Tomatoes — to tell you a film’s release date, cast, director, and runtime. 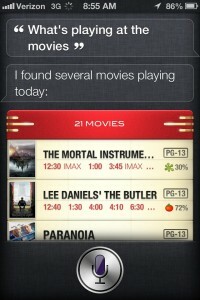 Siri can even help you purchase movie tickets. 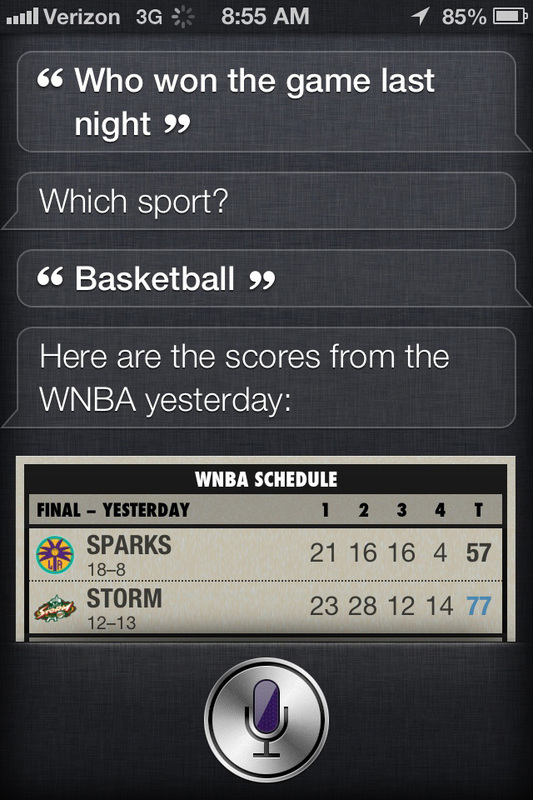 Siri can help you stay on top of your favorite sports. 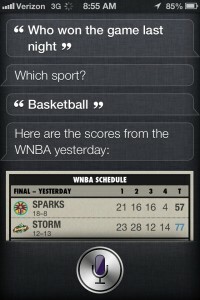 Siri has direct access to all pro sports scores, individual stats, game dates, and more. 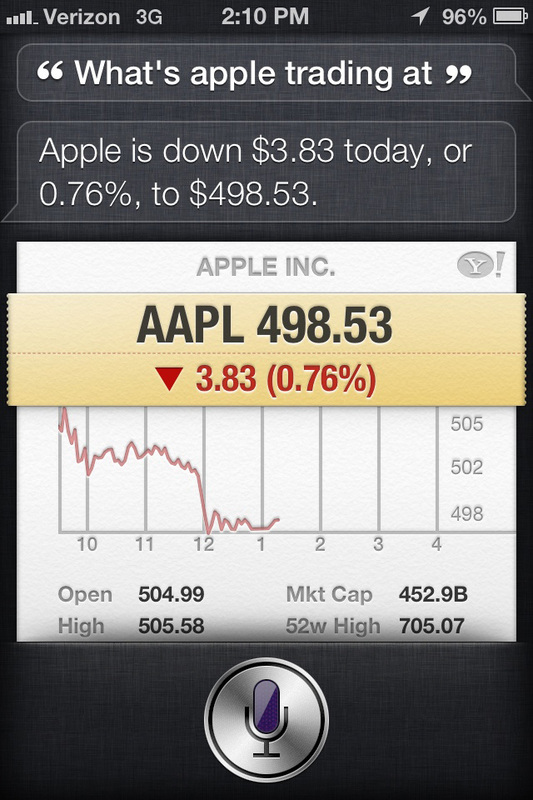 Siri can keep you up-to-date on the stock market. 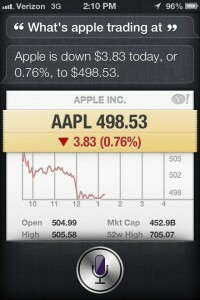 Siri can tell you just about anything you want to know about current market conditions, or the day’s activities. Sure, you can check Bloomberg or the Wall Street Journal for more details, but if you just want the facts, Siri will tell you what they are. 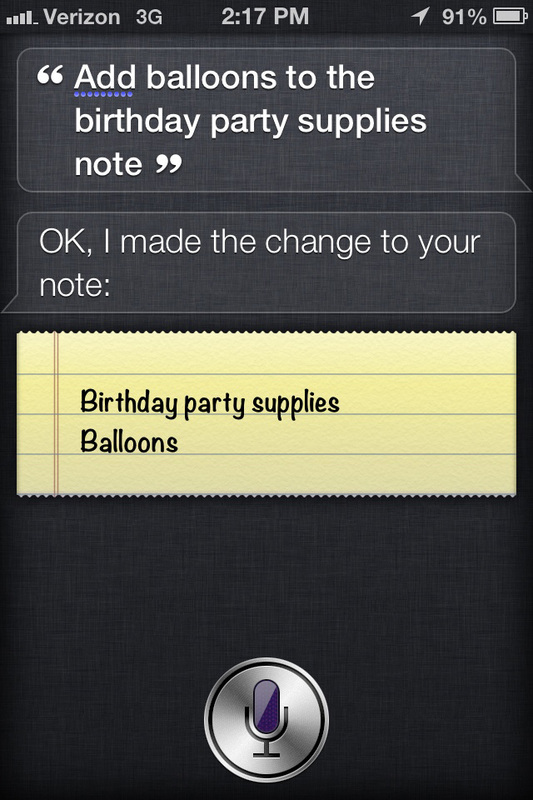 Siri can take notes for you. Got an idea in the car, but can’t stop to jot it down? Just tell Siri. 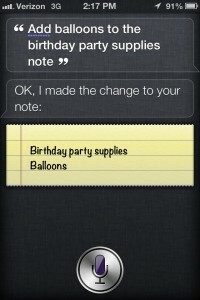 Siri will start a Note with whatever information you provide, and can even add info to an existing Note. 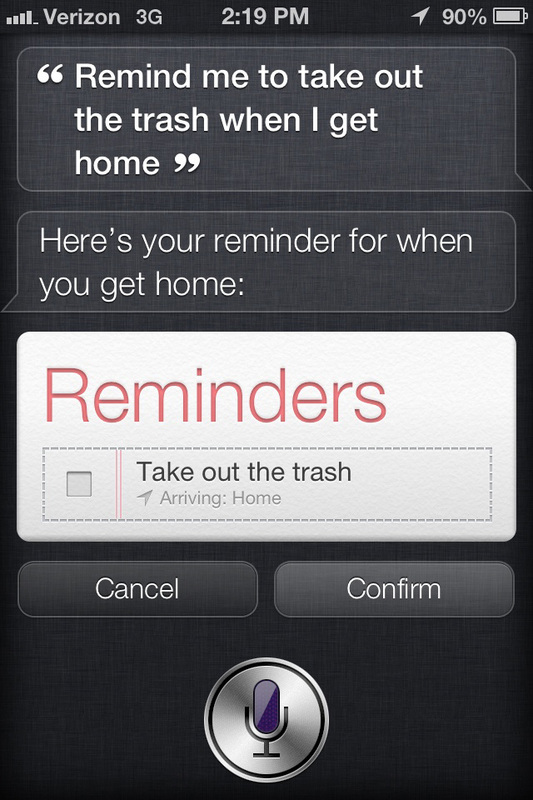 Siri will remind you about anything you want, at any time or location. iOS Reminders app interfaces directly with Siri, so you can create a to-do list or a more urgent reminder that’s based on time or GPS location conditions. 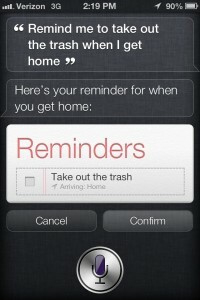 Siri can call, text, email, or FaceTime anyone for you. 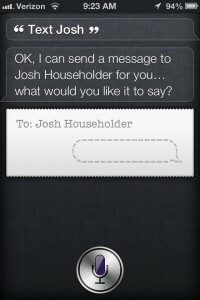 Regardless of how you interact with friends, co-workers, and family, Siri can do all the heavy lifting for you. 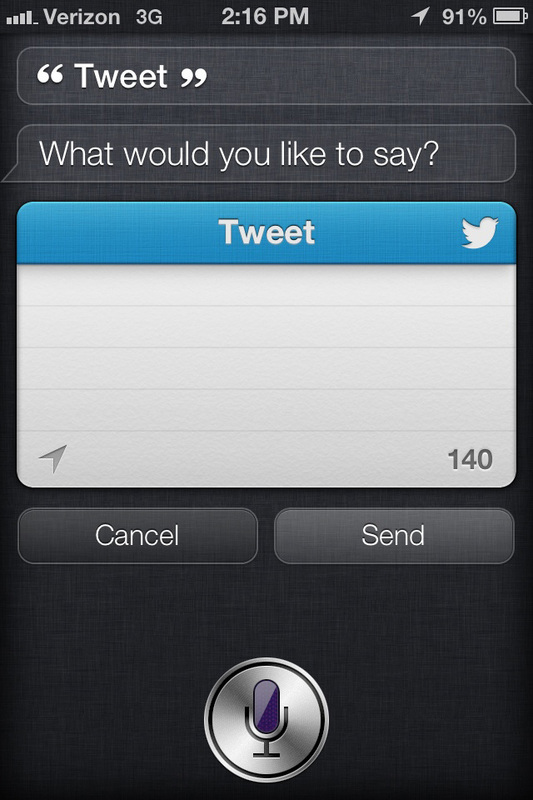 Instead of going to the Messages app and typing in the recipient and your message, just tell Siri to do it. Siri will also check your messages, voice mail, email, and so on. Siri can Tweet or post an update to Facebook for you. 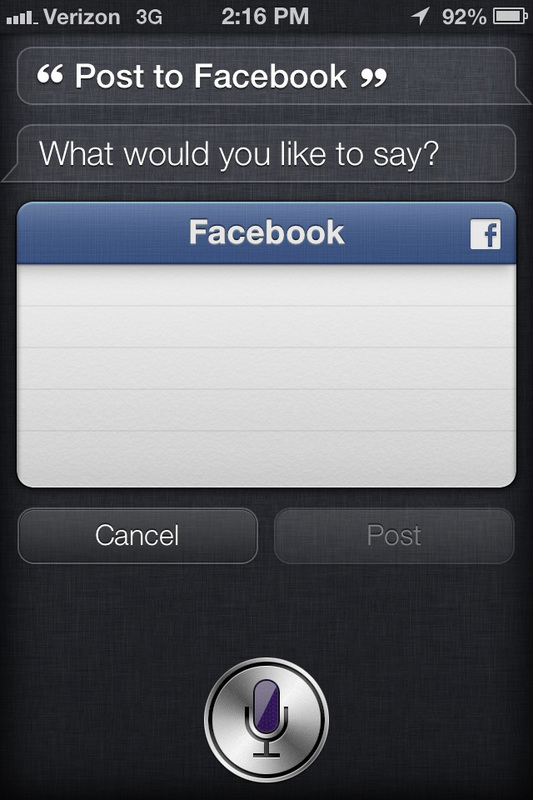 Just tell Siri what you want to post, and it’s done. 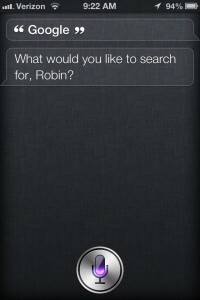 Sadly, Siri can’t post photos (yet). 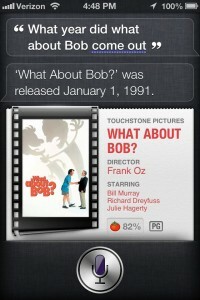 Siri will search the web via Bing or Google — your choice. 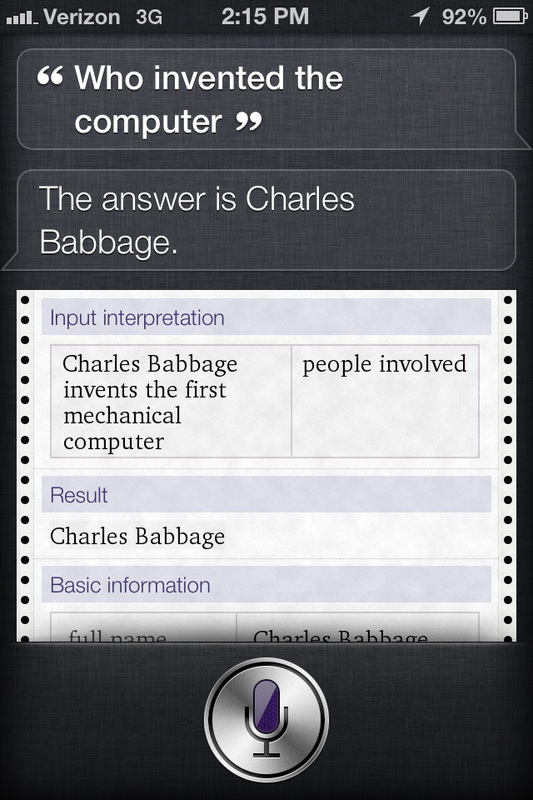 Siri defaults to Bing, but if you prefer Google, just ask for it. 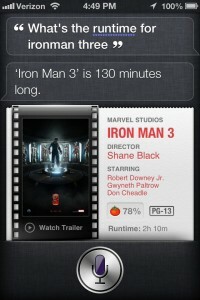 Siri can launch any app for you. 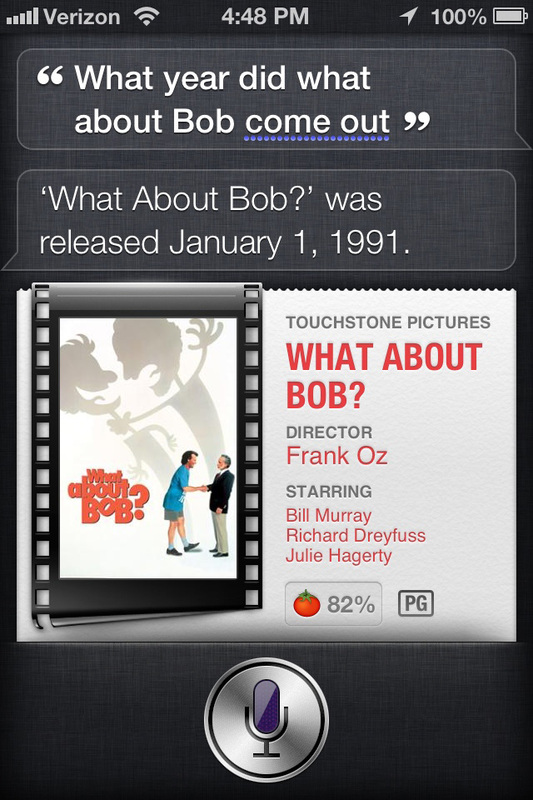 As long as you use the correct name of the app in question, Siri can open it for you. 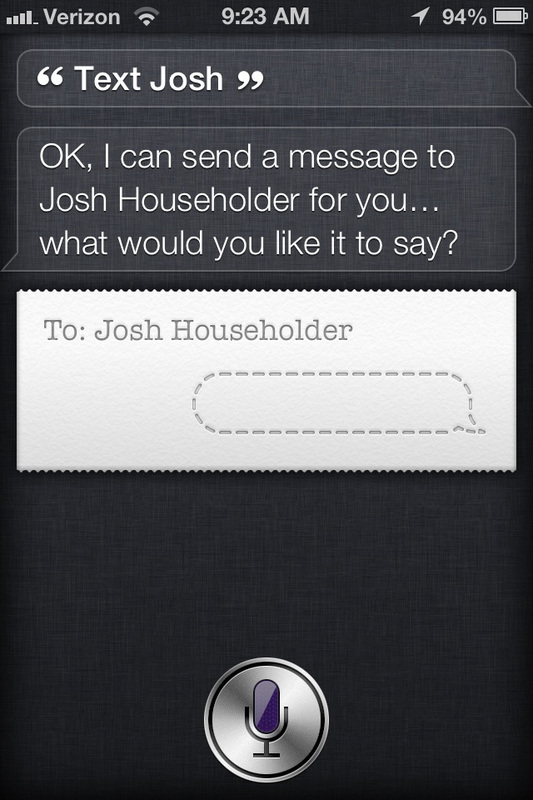 That’s all she can do with your apps for now; deeper interaction is expected in the future. 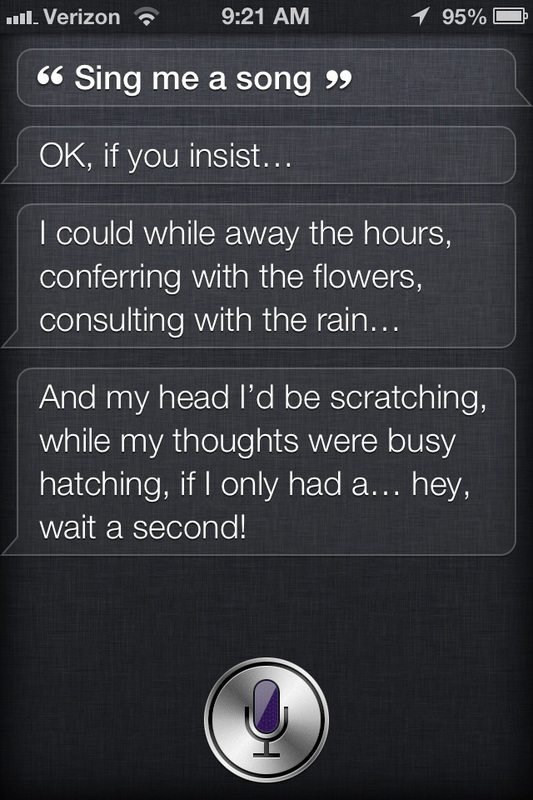 Siri can play music for you. 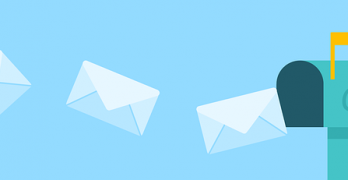 Request a song, an artist, genre of music, or your own playlist. 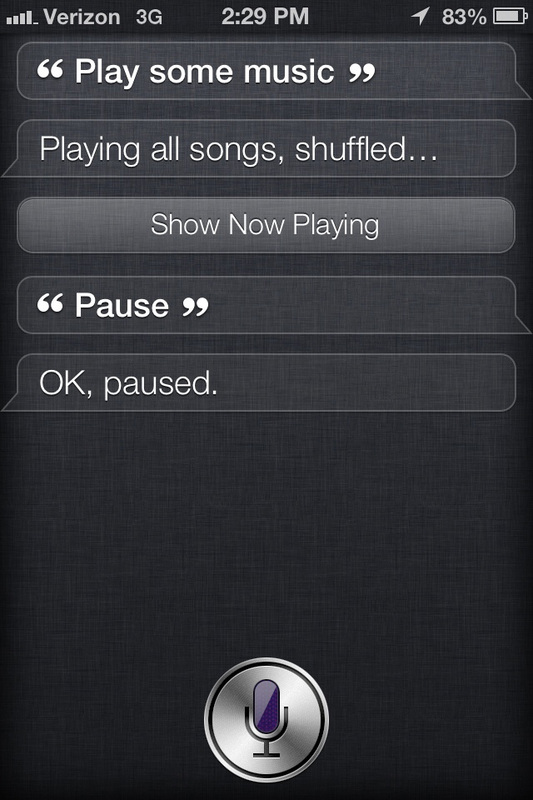 Siri understands them all, and will even shuffle your tracks. (Note that Siri can only interact with the music stored on your device; Siri will not find/play music on the Web or in another app like Spotify.) 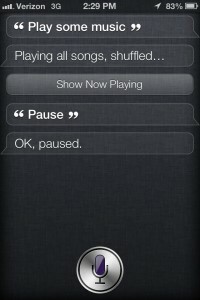 Siri will also obey your “Play,” “Pause,” and “Skip” commands while your music is playing. 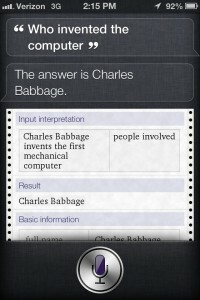 Siri can answer factual questions. Siri can interface with Wolfram Alpha to answer your factual questions, such as math, science, literature, and history. Want to impress your friends? 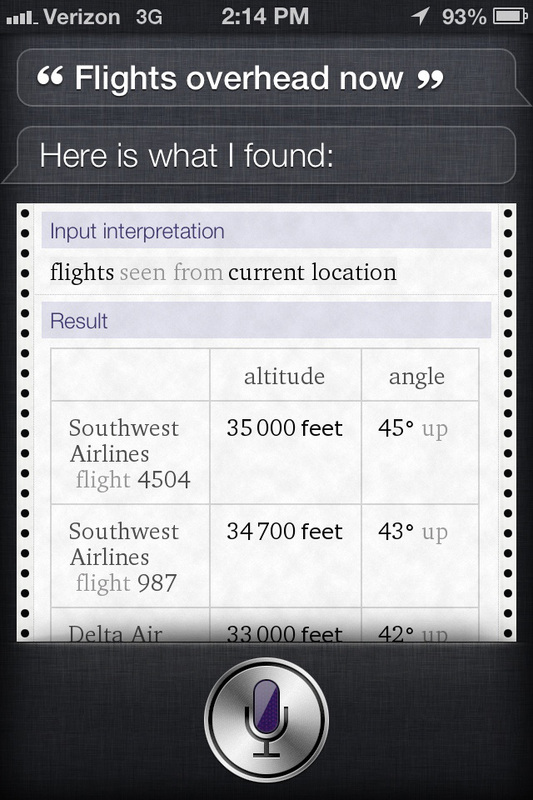 Ask Siri what planes are flying overhead right now. 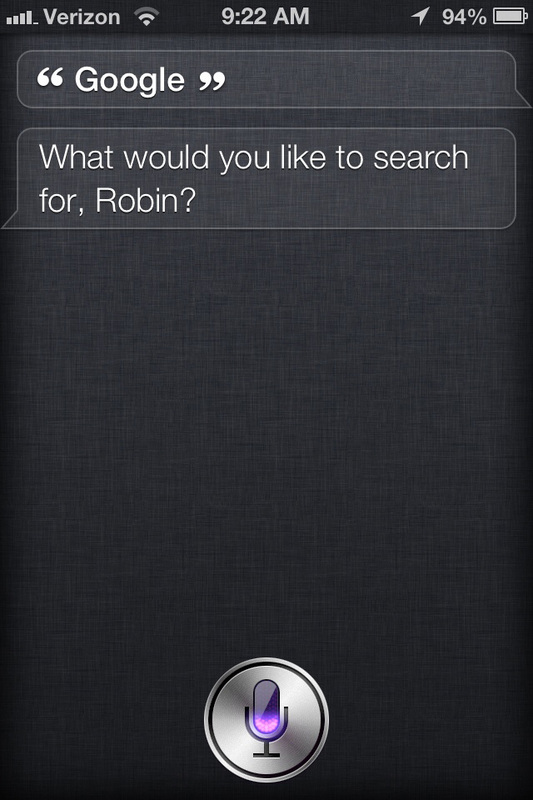 Siri can show off her personality. 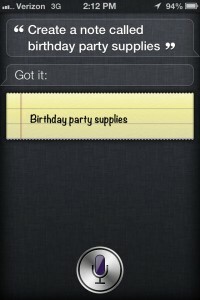 Siri’s sense of humor or her sassy answers to your snarky questions are well documented. 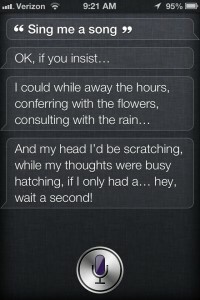 Among her many tricks, Siri can tell jokes, sing songs, and tell you stories. 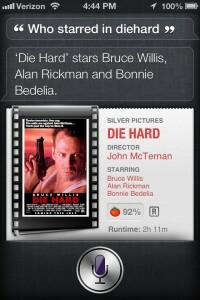 So what do you use Siri for? Can Siri verbally remind me my calendar alerts? Yes I am sure she can. 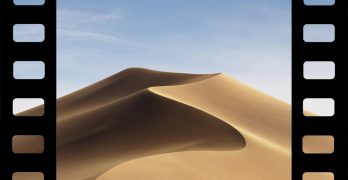 Why can’t SIRI give me the distance between two cities? can Siri tell me the weather then my calendar of events and respond to snooze voice commands or will i have to set 2 separate alarm events?